Two endangered fish species who call Hudson River home - the Atlantic and shortnose sturgeon - are recovering from threats as diverse as overfishing to development along their watery habitats (though bridge workers, for example, now take steps to make sure construction noise won't disturb the sensitive species). And a New York brewery is raising a glass to these large fish, in the hopes of ensuring a safer future for the long-lived animals. The Peekskill Brewery held an online contest to see what its next beer would be named, the Associated Press reports. The beer, dubbed "Lucky Sturgeon," joins Amazeballs, Tiger Mom and other eclectically-named beers in the brewery's repertoire, beating out potential monikers like Pure River Ale and Sue the Bastards Ale. According to the AP, any profit the brewery makes from sales of its new IPA will go to benefit the fish via Riverkeeper, a local environmental group. 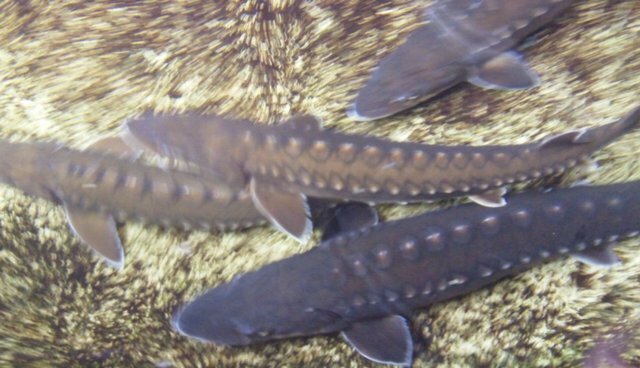 The Atlantic sturgeon, who can live up to 60 years, number about 4,600 juveniles at last count; female shortnose sturgeon can also live for close to 67 years, and have a likely population size between 26,000 to 55,000 according to the IUCN. To the fishes' luck turning - na zdrowie!